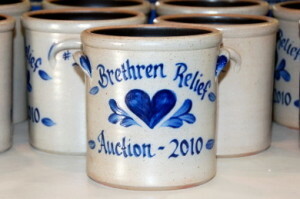 The Brethren Disaster Relief Auction is a non-profit, all volunteer organization whose goal is to raise funds to support disaster needs locally, nationally, and around the world. Multiple types of auctions are held the 4th weekend of September each year at the Lebanon Fairgrounds with proceeds disbursed largely to Brethren Disaster Ministries. Folks contribute in a variety of ways, including volunteering time, donating food and items to be sold, and purchasing at the auction. Florin has been integrally involved by providing leadership, lending our facilities for the “bucket brigade” for building thousands of disaster relief kits, and general participation in auction activities. Our “soul” inspiration is helping others in need.